As the summer selling season is coming to a close, home sales are beginning to cool. This happens every year, as the fall and winter seasons are traditionally much slower than the summer. However, demand is still present year-round in the DFW area, which keeps the situation competitive, and prices up. Rental prices are also continuing to rise, which lures people toward home ownership. North Texas Real Estate Information Systems (NTREIS) released their market statistics for the month of September (stats are from the month prior – August) which show closed sales actually up .2% at 10,530. 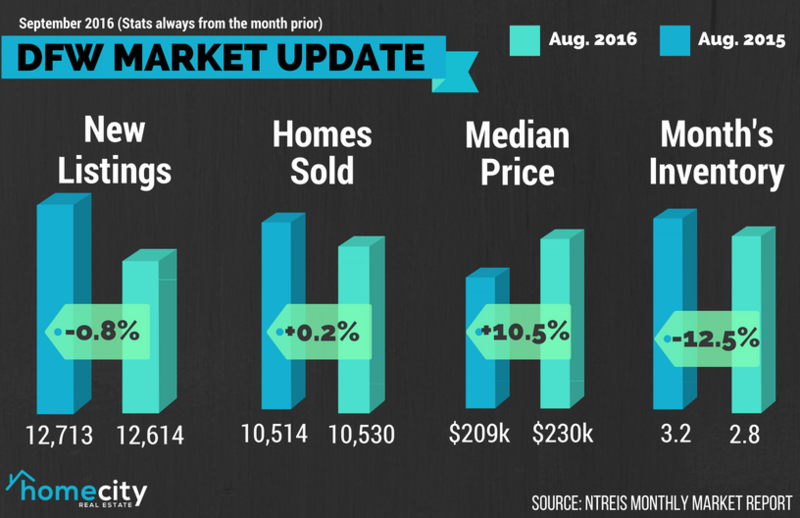 New listings went down .8% to 12,614. The market is continuing to get more competitive as the average number of days the average listing spends on the market dropped 5.1% to 37 days. Affordability in the DFW area is becoming an issue as home prices continue to rise. The median price for the average home in the Dallas metroplex increased a whopping 10.5% in August 2016 to $229,900. While this is much higher than most residents are used to, we must remember that it’s still very affordable compared to the rest of the country. To give you a visual, Metrocosm created a 3D map of the United States that shows the price per square foot around the country. Dallas sits at $98/sqft, while its neighbor to the south, Austin, registers at $166/sqft. Giants like Los Angeles, California ring in at $370/sqft and New York at a whopping $1,397/sqft! Major employers are flocking to places like Plano and Frisco because of the low cost of living, which is keeping demand high. Inventory of homes for sale went down 8.4% and month’s supply of homes currently sits at 2.8% (12.5% less than the same time last year). The Real Estate Center at Texas A&M cites 6.5 months of inventory as a balanced market. As you can see, we’re way below that, which creates the competitive atmosphere we’re currently experiencing. Adding to the mix, mortgage rates are the lowest they’ve been in years, encouraging people to buy. Now, more than ever, it’s incredibly important to enlist the help of an experienced real estate agent. Whether you’re buying or selling, having the help of an expert in imperative when negotiating the best deal.